So, when the going gets tough, the tough go shopping. It’s time for my semi-annual clothes shopping spree, part one. Today, Anne and I went to REI. She exchanged some bike shorts for another brand that fit better. I bought a pair of shorts, because it has got to start getting warmer some day. Right? I also bought a pair of sandals. They were Chico sandals, which are new to me. I’ve always used Teva. I’ve tried Keens, but I didn’t like their bumpy insoles. I’m taking the ones I bought back and are going to try the wide ones instead. Enough of this fashionista stuff. I’m long past my clothes make the man phase. We were in Ann Arbor last Christmas. Anne and I walked around downtown. It was pretty much a ghost town, with all of the students away for break. The State Theater sits at the top of Liberty. 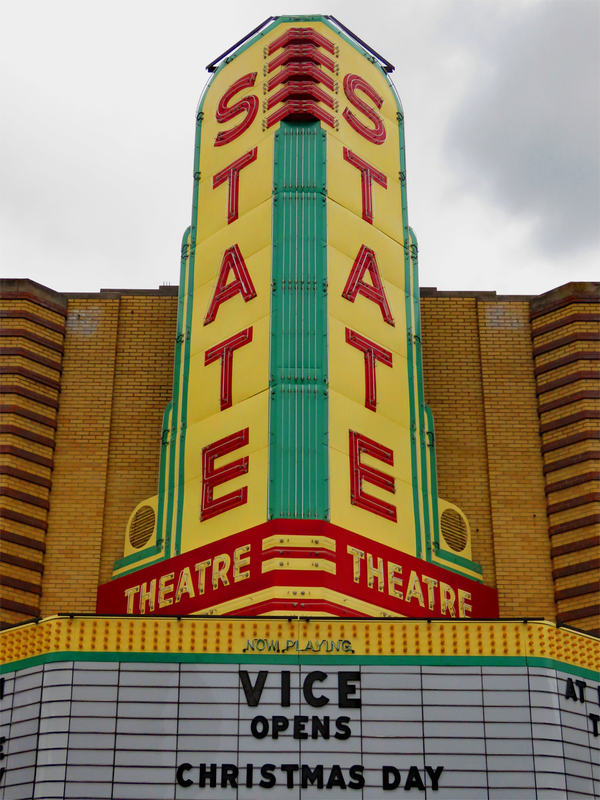 It and the neighboring Michigan Theater are both iconic movie palaces. In the past, I’ve posted pictures of the two, lined up to make a Michigan-State duo, which I have always found to be funny, in this home of the University of Michigan. I think that the last movie that I saw at the State was the 1979 Sci-Fi horror flick, Alien. I hadn’t heard that much about the movie before we went to see it, except that it was Sci-Fi and was about outer space. We arrived late and the only seats that were available were front row center. It was quite an experience, first not seeing, then finally seeing the alien monster, as it hunted the hapless crew, picking them off, one-by-one. It was thoroughly frightening. My Keens are growing on me. Which means I’m slowly becoming my father…. Luke, you can destroy the Emperor. He has foreseen this. It is your destiny. Join me, and together, we can rule the galaxy as father and son! Good luck with your daddy issues.